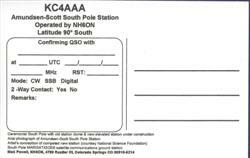 Nowadays we have satellite phone hookups plus voice-over-IP (VoIP, or "internet phone calls") from Pole when the satellites permit, but once upon a time ham radio was the only way to talk to the folks at home. 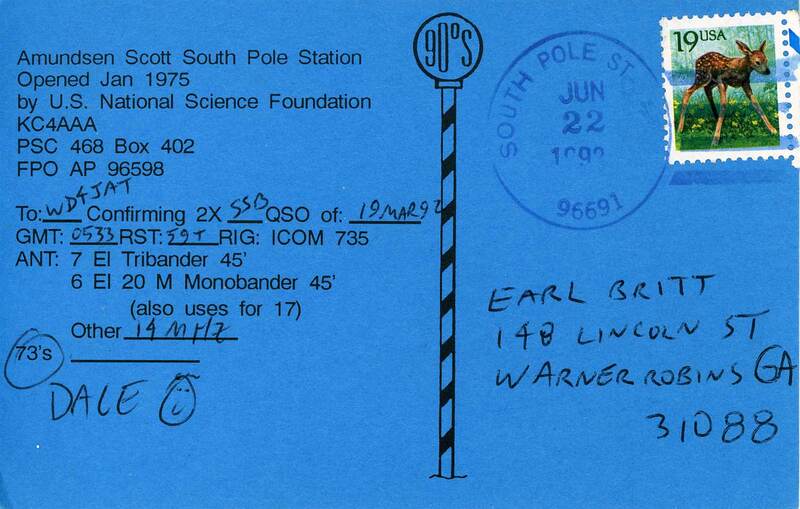 Here are a few of the QSL cards which Pole used to document radio conversations with the rest of the world. 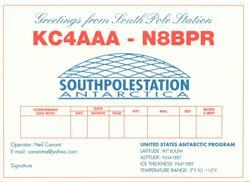 These were very popular, and took a bunch of time for the QSL manager back in the States to keep track of and send out. This is probably the first QSL card from Pole...vintage DF-III (1957-58). 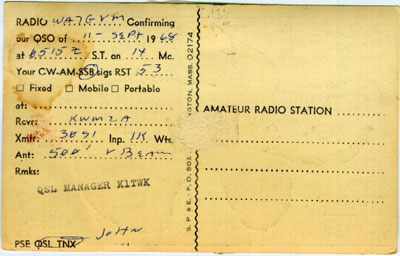 This one may well be the second card; this particular one is cancelled October 1965 (view of other side). 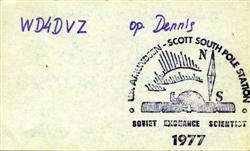 This one is from 1972. 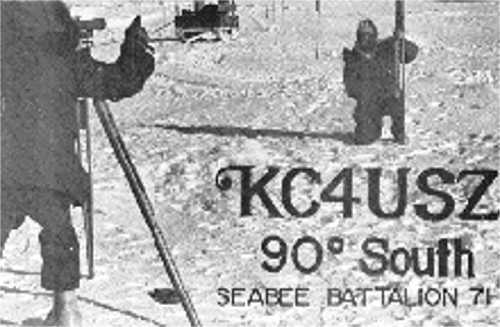 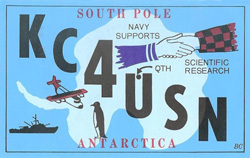 The US* call signs were used by the Navy-operated Antarctic facilities, which of course included Pole at that point. 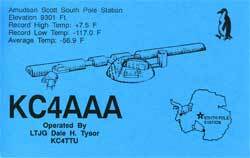 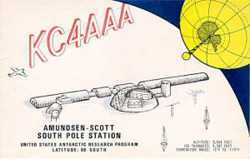 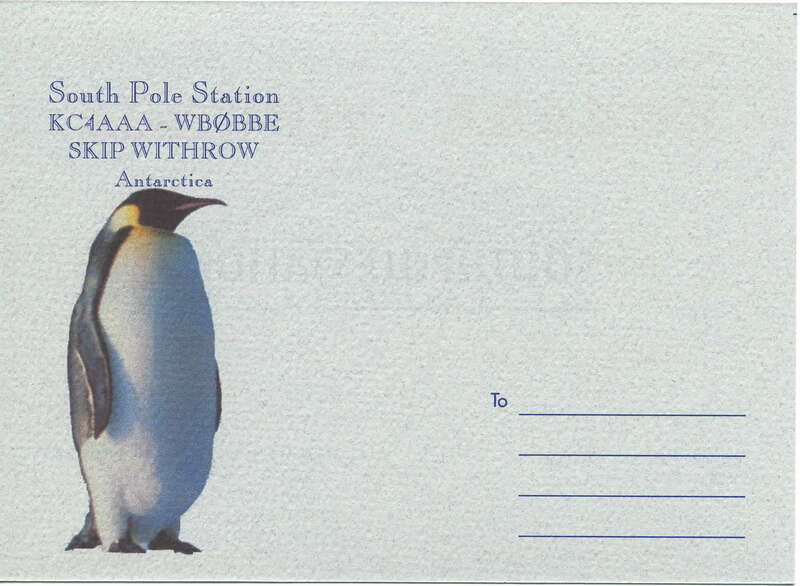 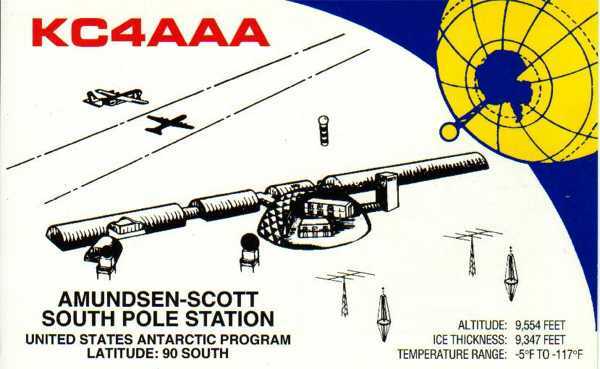 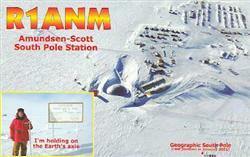 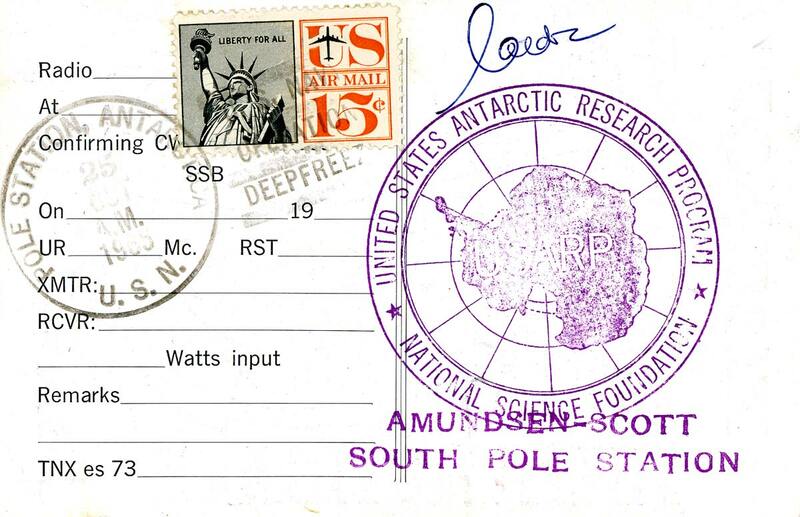 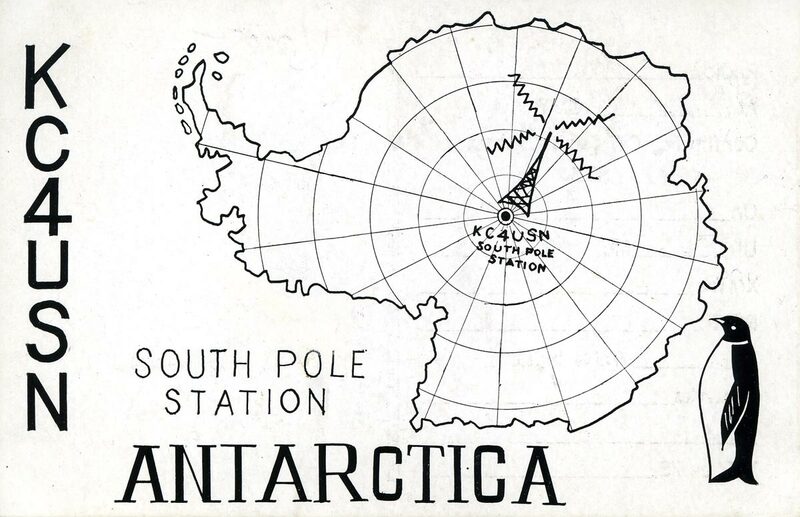 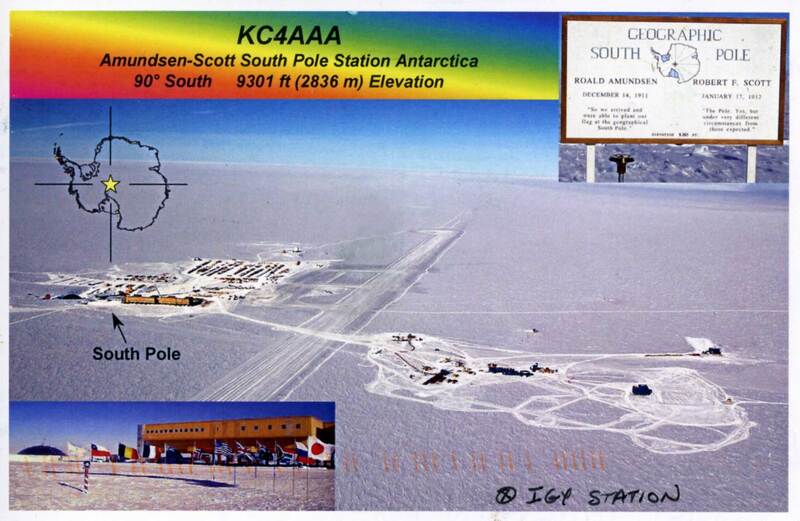 This is one of a series of cards used for the various stations with only the call sign and QTH (location on the map of Antarctica) different. 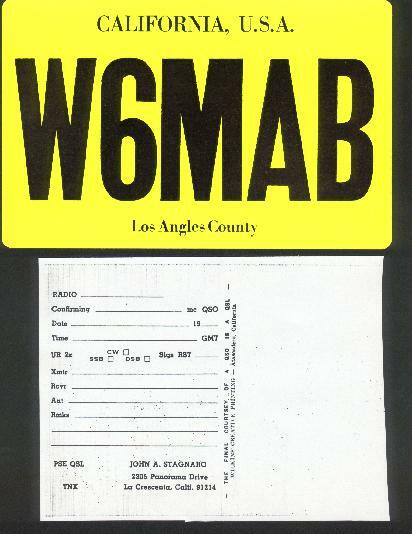 Here's what the back of this one looked like. 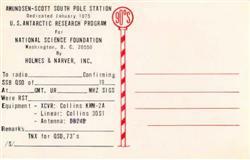 Here's another from Old Pole around the same time, showing a trackmaster parked at the main entrance (Holy stairs). 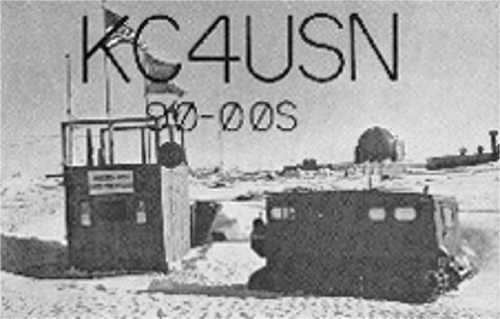 This card was for the ham station operated by the Seabee battalion NMCB-71. 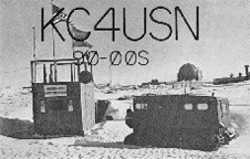 The battalion constructed the dome, arches, and all major structures of the new station. 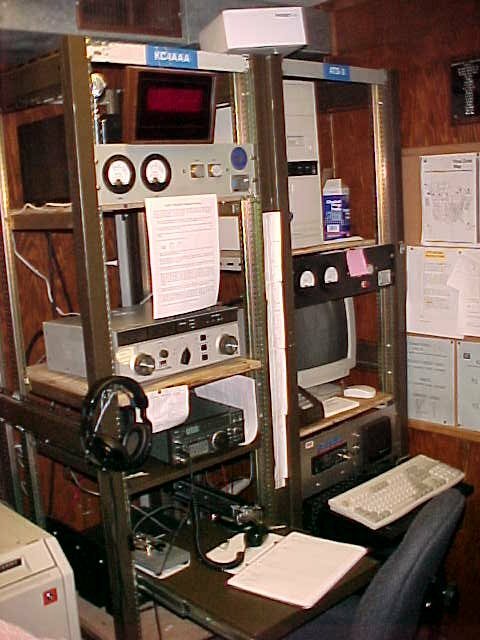 The original ham shack was constructed from a shipping crate at the dome end on the galley side of the street. It was next door to the officers' berthing Jamesway (called the "Courthouse" by the troops). 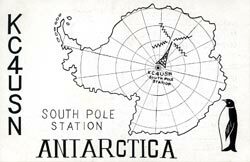 It was located there so that officers could speak to their superiors via radio whenever atmospheric conditions allowed. 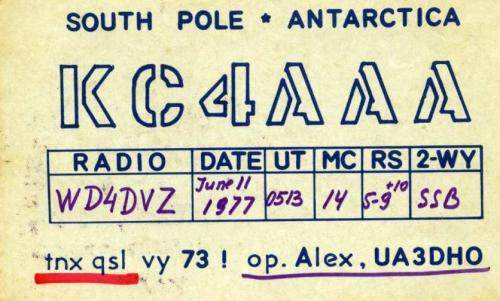 Here's our 1976-77 card...our regular contacts included Ken McLeish (W7TX) and the late Big John Stagnaro (W6MAB). 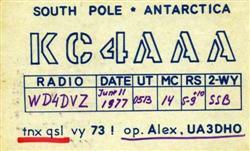 Another card, this one unique to 1977, used by our Russian exchange scientist Alex Zaitzev. 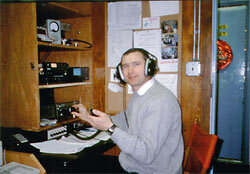 Alex was one of our 5 licensed ham radio operators. 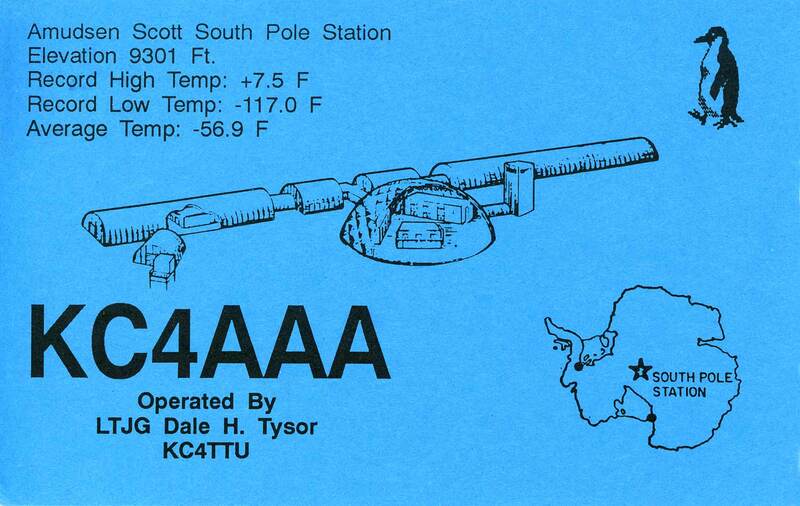 This blue card that I recently acquired was sent out in 1992 by the w/o NOAA researcher Dale Kysor. 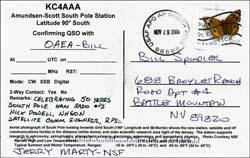 There was more than one QSO with this guy, here is a second card from a few days earlier. This one was created by Peggy Klinedinst, the 1993 w/o meteorologist. 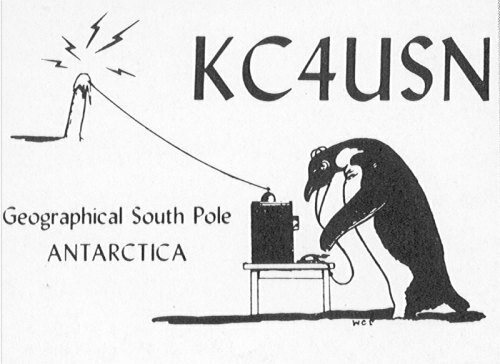 Okay...let's keep going with some newer ones from this century. 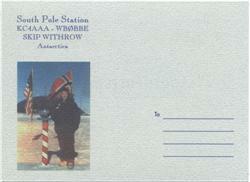 The rest of these were sent to me from Pole by Skip Withrow in 2001-02. 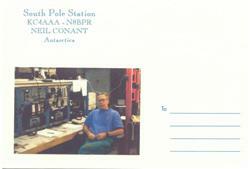 Skip spent several summers at Pole and also went to Palmer to work on the satcom installation during the 2002 winter. 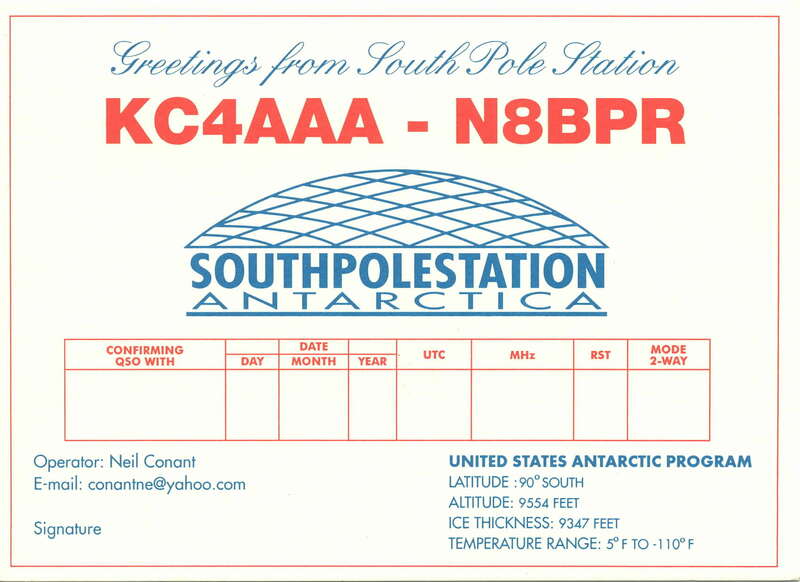 Anyway, we'll start with this one from Neil Conant, a South Pole institution since, well, I met him at Siple before that started...the back side includes his photo. 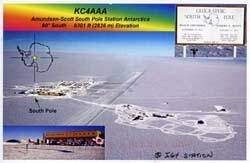 This card is from Nikolai Makarov, who visited Pole for several summers working on the meteor radar project for UC in Boulder. 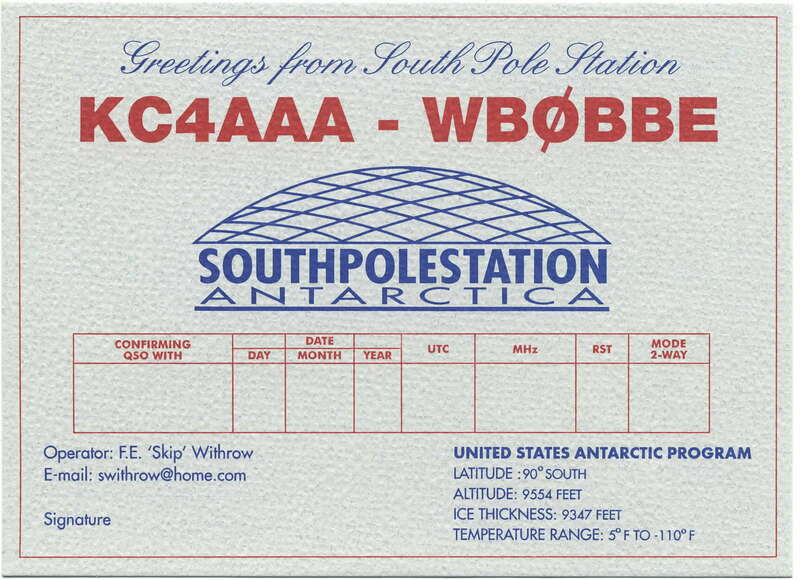 He was involved when the first system was installed in 1995-96...this card is from his 2000-01 and 2001-02 visits. Since I didn't get the back side of the QSL card, I threw in a photo of Nikolai in the ham shack, from his web site (the Pole frame). 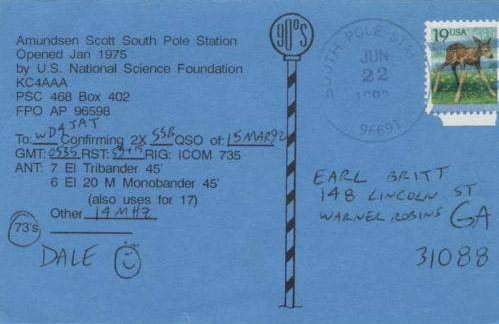 Here is Nick Powell's card...notable since it features the new station as well as the SPMGT (South Pole MARISAT-GOES terminal), albeit sans radome. 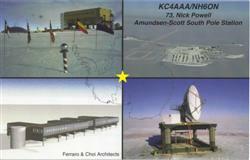 Nick is still around, and he just sent me another version of this one. 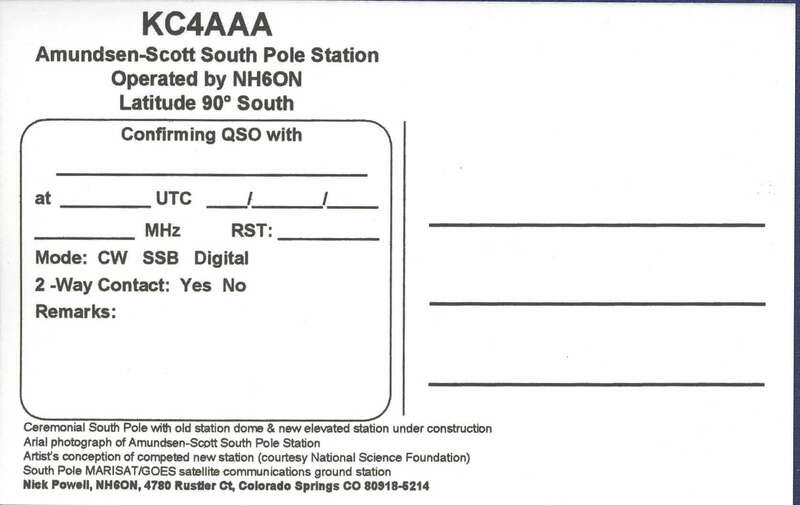 Well, with the historic dome comms and ham shack gone, so at last is the old dome QSL card. 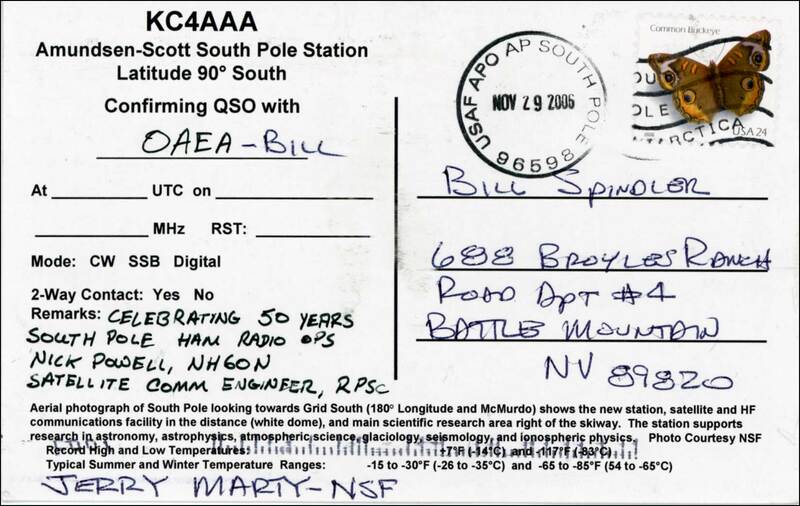 Here is a newer one received on 8 December 2006, with thanks to Nick Powell and Jerry Marty.